When planes break the sound barrier a sonic boom can be heard as well as a cloud behind the aircraft see for yourself in these amazing pictures of fighter jets breaking the sound barrier. A sonic boom is the sound associated with the shock waves created by an object traveling through the air faster than the speed of sound. 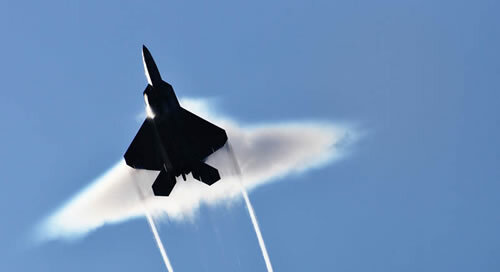 Sonic booms generate enormous amounts of sound energy, sounding much like an explosion. So that means that the sound source plane, will pass by a stationary observer before they actually hear the sound it creates.